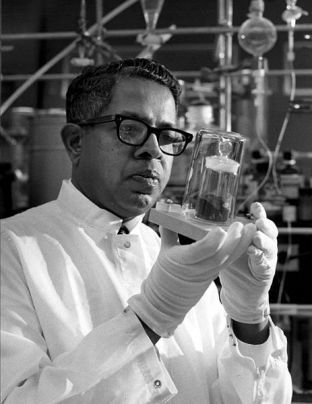 On 20 December 2009, we mark the 15th death anniversary of Professor Cyril Ponnamperuma, one of the best known scientists produced by Sri Lanka during the Twentieth Century. I grew up reading about him in school text books as a living icon of modern science: a developing country scientist whose brilliance and hard work took him to the highest echelons of global science, and one who was respected in the West and East. He was both an internationally recognised researcher on the origins of life on Earth, and an early promoter of science and technology for development. His interests and involvements transcended his own discipline and homeland. He worked closely with the Pakistani Nobel laureate Dr Abdus Salam to promote science and infrastructural facilities in developing countries. I focus on the few years from 1984 to 1990, when he served as science and technology advisor to two Presidents of Sri Lanka. Concurrently, he served as director of the Institute of Fundamental Sciences (IFS) from 1984 to 1990, and was also founder director of the Arthur C Clarke Centre for Modern Technologies (ACCCMT) from 1984 to 1986. In these positions, he worked simultaneously on several fronts covering science policy, institutional building, fund raising, capacity building and public engagement. I’ve just written a tribute, recalling my own interactions with him in the last 1980s, when he was dividing time between Sri Lanka and the US. It’s published online at Groundviews website. In this essay, I recall both his accomplishments and failures. I ask why his passion for public science was not shared by many fellow scientists in Sri Lanka, who wanted to remain aloof of non-scientists and the community. Ponnamperuma’s tried to bridge this gap, and for this sin he was harassed and driven out of Sri Lanka and back to the United States where he returned to his research and teaching to the very end of his life. “Chemistry is the ‘other woman’ in my life,” Ponnamperuma used to joke. It was while working at his university office in the US that he suffered cardiac arrest and rushed to a Washington hospital, where he passed away on 20 December 1994. He was 71. His sudden death came as a shock to all those whose lives and careers were touched, influenced and inspired by him.